He comes up on stage and amazes the crowd with the many voices he can make. He says something funny and has the entire audience roar with laughter. He shares his visions and words of inspiration and simply makes everyone blown away. 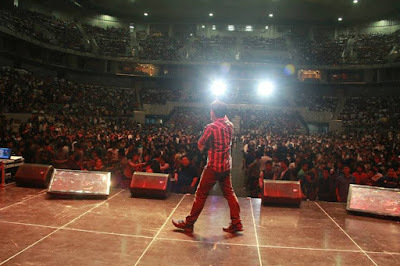 Is there any other Filipino motivational speaker who can do all that in a single talk? The most recognized Filipino voice artist. Veteran radio broadcaster.Internationally-awarded youth advocate. Author. Highly sought-after voice director, trainer and motivational speaker. 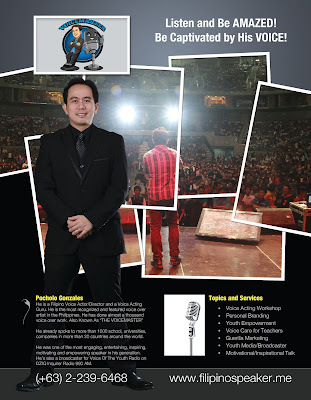 Pocholo de Leon Gonzales is known as the “VoiceMaster of the Philippines” for having utilized his voice not only for the purpose of entertaining people, but more importantly for inspiring, motivating and empowering particularly the Filipino youth. At the young age of 16, Pocholo started his voice acting career after winning a competition in DZMM’s drama and singing contest “Radyo, Radyo” where he later became one of the anchors, scriptwriter, and co-director. His voice has since then been used for thousands of anime characters, hundreds of local radio and television commercials, various children’s programs, films, dubbed foreign telenovelas, drama, TV shows, video games and audiobooks. He has also done work for many TV and radio stations – both major and minor – as a reporter, broadcaster, host, voice over, radio drama talent and voice director. Pocholo aced his education as a BA Speech Communication graduate from the University of the Philippines, Diliman. He then took his MA in Broadcast Communication in the same school, all while he is making his name in the voice acting industry. Pocholo’s biggest accomplishment as a voice artist is being the voice of the greatest book ever written – the Holy Bible. 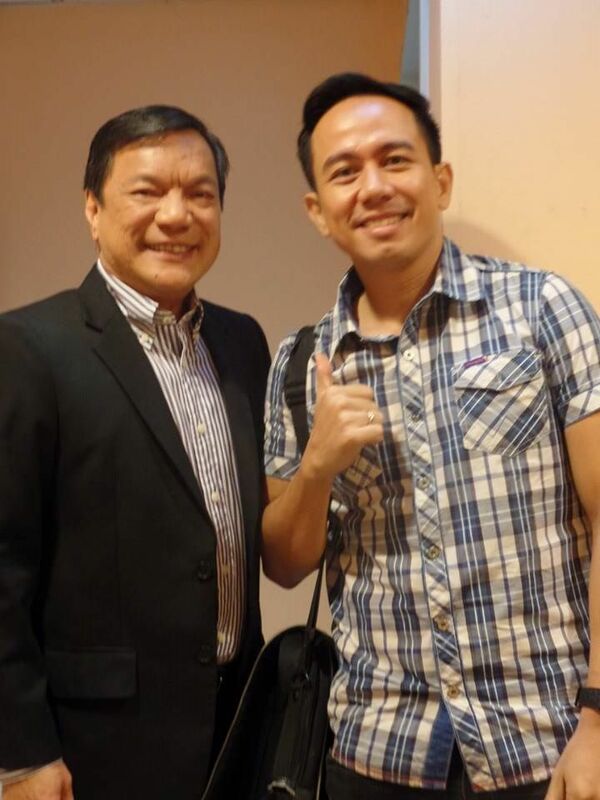 Pocholo has been selected among dozens of voice artists to read the Filipino AudioBible produced by Biblica, the world’s largest distributor of the Bible in different languages round the world. 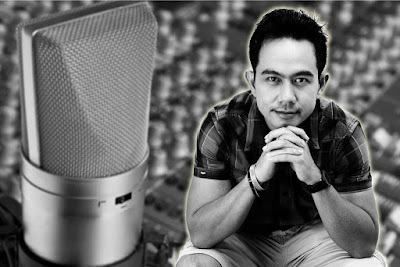 Pocholo believes that voice acting is an art that needs to be further developed. 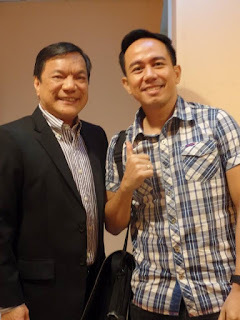 With his vision is to make the Philippines the center of voice-over excellence in Asia, he established Creativoices Productions in 2005, the premier voice over company in the country today. Under his company, Pocholo built the first and only voice acting school in the country, the Philippine Center for Voice Acting. This school conducts voice acting workshops – more popularly known as “Voiceworx” – and opens the door for aspiring voice artists to get into the used-to-be exclusive industry of voice acting. 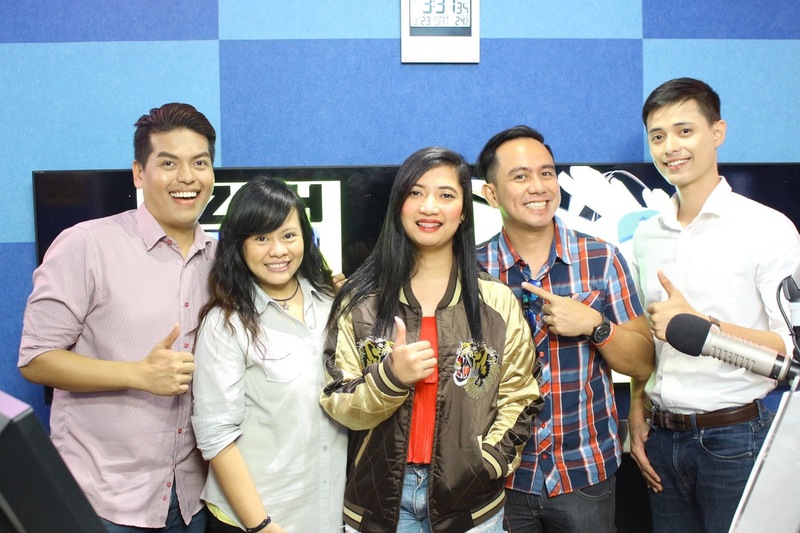 For more than a decade, the school has produced more than 1,000 graduates and hundreds of voice artists, who now make up about 90% of talents that dominate the industry today – as voice actors, hosts, broadcasters, and even public speakers. 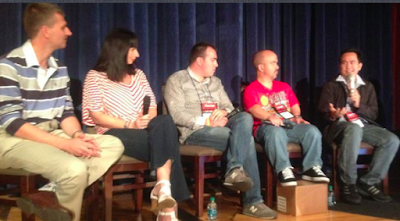 Because of all his accomplishments as a voice artist, Pocholo became the only Filipino/Asian panelist in the 2012 VoiceOver International Creative Experience (VOICE) Convention held in Anaheim, California. Pocholo is the founder of Voice of the Youth Network (VOTY), an advocacy organization that aims to inform, inspire, involve and empower the Filipino youth through media and Information and Communications Technology (ICT). VOTY has over 20 radio programs all over the country, all of which are produced by the VoiceMaster. VOTY has become a venue for the young members of the society to have a voice on issues that affect them and contribute to positive social change. Through VOTY, Pocholo has shared numerous opportunities to the youth to attend seminars and events that inform, inspire, involve and empower them. Pocholo has been honored locally and internationally for his contributions to empowering the Filipino Youth. In 2003, he was awarded as a District Winner in the 2nd Quezon City Youth Achiever’s Awards, and also received the 2nd YouthActionNet Award given by the International Youth Foundation in Washington DC in the same year. He also received the Global Youth in Action Award in New York City in 2004. In 2014, the International Youth Assembly and Youth Federation for World Peace awarded him as a Youth Ambassador for Peace together with one of the country’s most famous actors and a fellow youth advocate, Dingdong Dantes. Pocholo is also one of the finalists of Asia CEO Awards for the Young Leader of the Year in 2014, and a nominee for the 2014 The Outstanding Young Men Awards. He has been awarded as a one of the 2015 Ten Outstanding Movers of the Philippines Awards by SAVE ME Movement. As a veteran voice artist, Pocholo understands the importance of voice, not only for his craft, but also for “professional voice users” – people whose livelihoods rely mainly on their voice. This is why he founded Voice Care Philippines, a non-profit organization that aims to teach professional voice users how to take care of their voice, and to use voice acting techniques for effective speaking. Aside from doing motivational talks in schools and universities for students, Pocholo has also travelled around the country to impart this knowledge through the Voice Care for Teachers program. 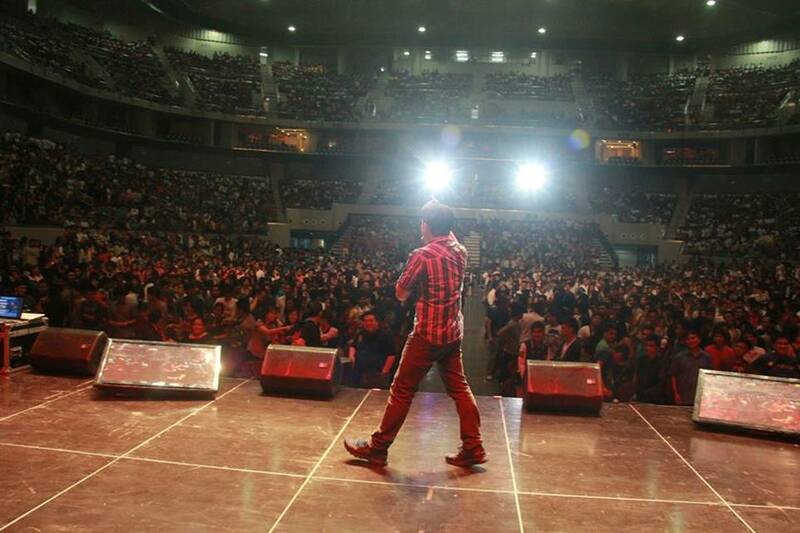 Pocholo also spreads his advocacies for the youth through his motivational talks. Being recognized as a truly inspiring and highly sought-after Filipino motivational speaker, he has been invited to take on the podium in more than 1000 schools and universities, as well as in various organizations and events here and abroad. He shares his knowledge and expertise in Voice Acting, Communication, Personal Branding, Guerilla Marketing, and Youth Empowerment and Development. There is never a dull moment when the VoiceMaster speaks. Whether he’s speaking to a group of a dozen students or to a crowd of 20,000 – be it an assembly of students or corporate professionals – Pocholo never ceases to captivate the audience with his voice. More importantly, it’s his heart for inspiring and empowering people that would make everyone wanting to hear more. 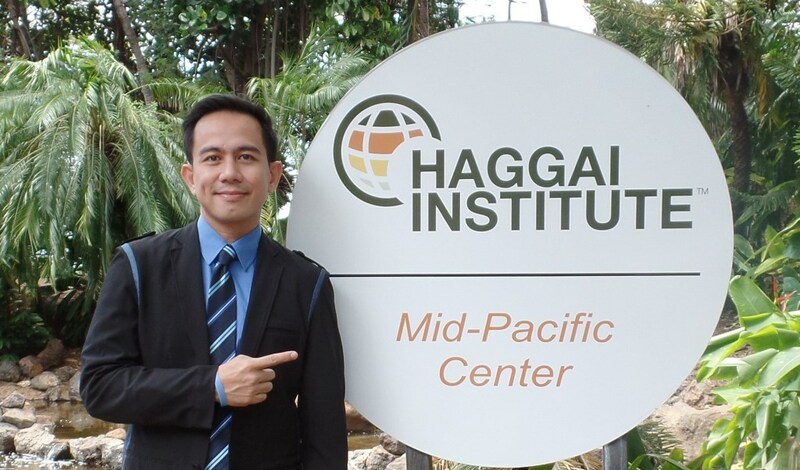 In May 2015, Pocholo has been chosen to be one of the delegates – and one of the youngest participants – to the Advanced Leadership Training of Haggai Institute in Maui, Hawaii. Haggai Institute is a worldwide community of Christian leaders that takes evangelistic expertise to places where it’s needed most. Students of the Advanced Leadership Training come from almost every profession from every Christian tradition. Despite the diversity of their backgrounds, all are focused on one task – bringing the values of Jesus Christ to the world, through direct evangelism or humanitarian efforts. Only established leaders in their own fields are qualified to apply for the training, after a rigorous screening process of more than 8000 applications from all over the world. Through this training, Pocholo has been able to take his advocacy of empowering his fellow Filipinos to the next level, not only by spreading the Gospel, but more importantly by setting an example of how to live life as a divine spark of God. In 2016, Pocholo launches Pochology Academy, a consortium of trainers and motivational speakers that teaches various life skills in the form of workshops, seminars and teambuilding programs. Pochology Academy is the “school of life” which empowers Filipinos towards greatness, excellence and success. Pocholo is the author of 2 books. His first book, “Voice Care for Teachers” is the written version of his Voice Care for Teachers workshop that provides tools and techniques to efficiently and effectively use the voice in teaching, and gives 21st century teaching strategies that engages 21st century students and also help preserve the voice. 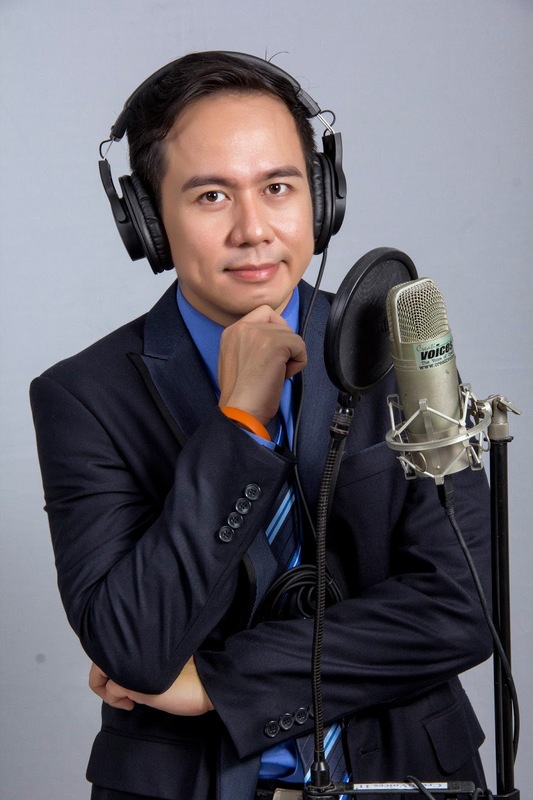 In September 2016, he released his second book, “Gusto Kong Maging Voice Talent,” that gives aspiring voice artists a roadmap to build a successful career in the voice acting industry. It is the first-ever voice acting book in the Philippines that Pocholo has written in celebration of his 20th year in voice acting.